We help the emergency services, they always look out for the sticker on the fridge! 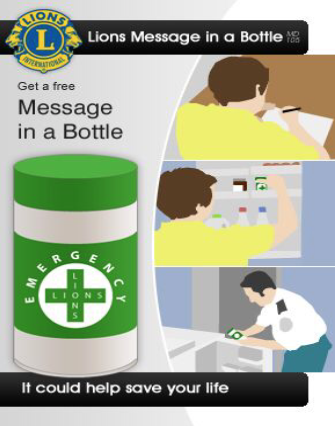 More than 5 million Message in a Bottle kits have been distributed by Lions Clubs British Isles & Ireland in recent years to people with conditions such as diabetes, allergies, disabilities and life-threatening illnesses. The bottles are supplied FREE of charge thanks to generous donations from the public and businesses. Paramedics, police, fire-fighters and social services support this life-saving initiative. They know to look In the fridge when they see the Lions Message in a Bottle stickers. If you know someone who needs a Message in a Bottle kit, please contact us.